Scotty McCreery has the Midas touch and is making history as his debut album, Clear as Day, enters the Billboard 200 chart at No. 1 with 197,000 sold, according to Nielsen SoundScan. This makes him the first country artist to debut at number one for their first studio album, as well as the youngest man to top Billboard their first time out. Further adding to the accolades; Scotty is the first Idol winner since Ruben Studdard in 2003 to start their career with a No. 1 album, and scored a No. 1 spot on iTunes and Billboard’s Country charts. Clear as Day also marks the biggest debut sales week of any Idol winner's first album since 2008, when David Cook's self-titled effort started with 280,000 (No. 3). Kris Allen saw his 2009 debut launch with 80,000 (No. 11) and in 2010, Lee DeWyze's Live It Up debuted disastrously with 39,000 (No. 19). As if all this wasn’t exciting enough, Scotty who just turned 18, received a Gold Record for his debut single “I Love You This Big” (signifying 500,000 copies sold) at a birthday party thrown by a radio station in his hometown. 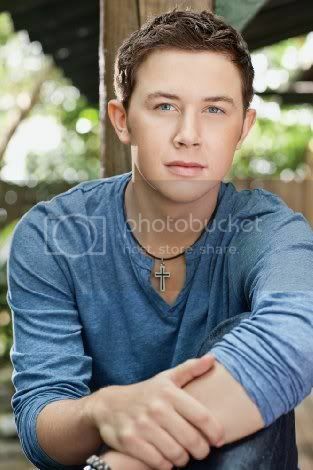 Scotty has also been invited to join country mega-star Brad Paisley on tour in 2012; dates have yet to be finalized and released. Wait, there’s more! The longtime baseball lover (and former pitcher for his high school team) got to combine his two passions, baseball and music, as he sang The National Anthem for Game One of the World Series last night in St. Louis, Missouri. There was a little bobble in the beginning as the audio wasn’t working but, Scotty worked through the technical glitch like a pro, and the end result was pretty damn good and twangy.